The Rifle No.4 Mark 1 originally appeared in 1931. It was finely made, and was generally similar to the No. 1 Mark VI except that it had a heavier receiver. It was redesigned for mass production around 1939 and became, with the No. 4 Mk1*, the British ‘work horse’ of World War 2. These are No. 4 rifles of various types (MK. 1, 1*, 2. etc.) which have at some point been converted to LS9A1 ‘drill purpose’ rifles, making them quite unusual. A couple still have the copper-plated bolts associated with this conversion. They have since been deactivated to current UK specification, and marked as such and come complete with a proof house certificate to that effect. 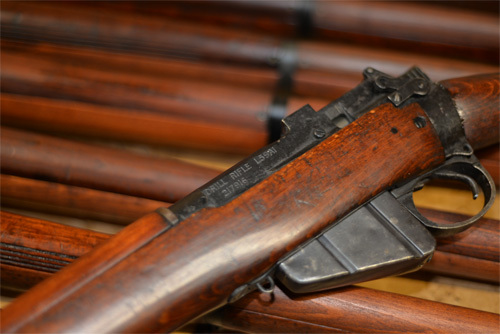 These rifles are complete and condition ranges from ‘good’ to 'excellent'. Picture for illustration purposes, pictures of specific guns are available on request.